Today Montana's newest brewery, Überbrew, opens for business. Located downtown it joins four other breweries (Montana Brewing Company, Carter's, Yellowstone Brewing, and Angry Hanks) as well as the Railyard Ale House (full disclosure - owned and operated by my parents and nephew) in Billing's "Brewing District." On a recent trip back to the Fatherland I was lucky enough to meet brewer Andy and owners Jason Shroyer and Mark Hastings to get a pre-opening tour of their pride and joy. The old brick building was once the bottling facility for the long-since-defunct Billings Brewing Company, which opened around 1900. 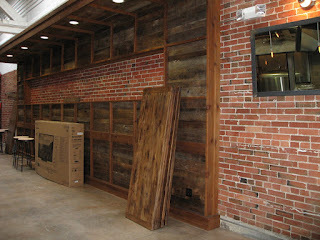 During Überbrew's construction process they uncovered feet of crushed glass under the floor, and found some nearly intact prohibition era bottles from the old brewery. Überbrew's main room appears to be an old alley that, in the distant past, was roofed over to create a new dwelling. The red brick walls are those of the neighboring buildings, and old painted timber rafters are exposed creating a unique atmosphere. Five skylights allow in natural light during those long Montana summer days. 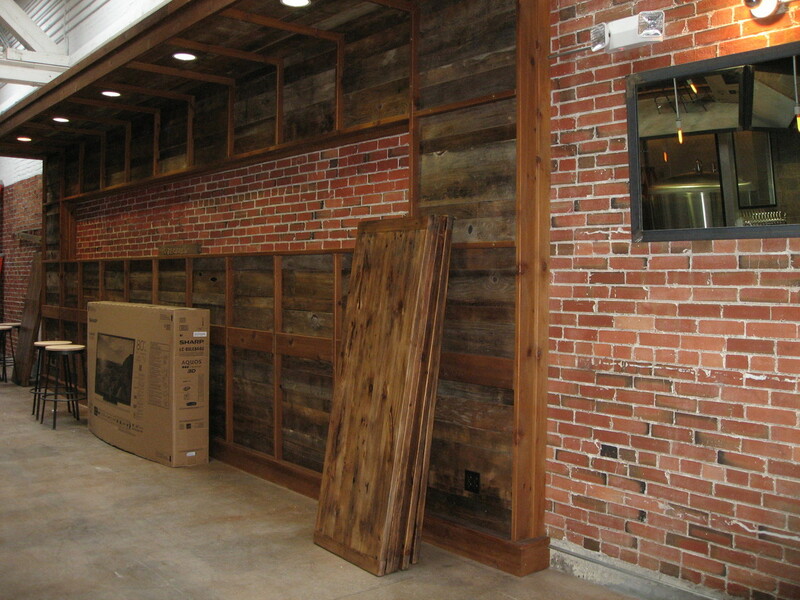 Mark and Jason used reclaimed barn lumber on the interior adding to the rustic ambiance. Their 40' long bar is also a thing of beauty made from stained and polished concrete. 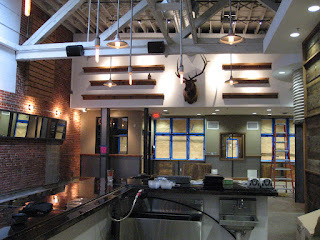 The mounted head of a bull elk overlooks the spacious tasting room. Maybe tasting room is not the proper term. One of Überbrew's hooks is that they have a full kitchen. They not only intend to serve food, but their goal is to highlight their cuisine and promote beer-food pairings. This is bit unique, since most of Montana's taprooms do not have kitchens. I was extremely impressed with Überbrew's brewhouse and serving cooler. Their systems and lines were meticulously planned and laid out. They are blessed with plenty of room - there is no clutter, and their working facility is kept very tidy. 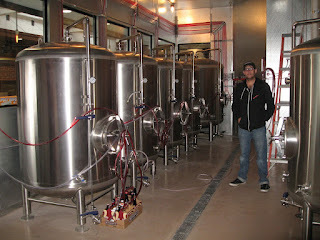 Andy provided me with an overview of their modern 10 bbl brewing system. 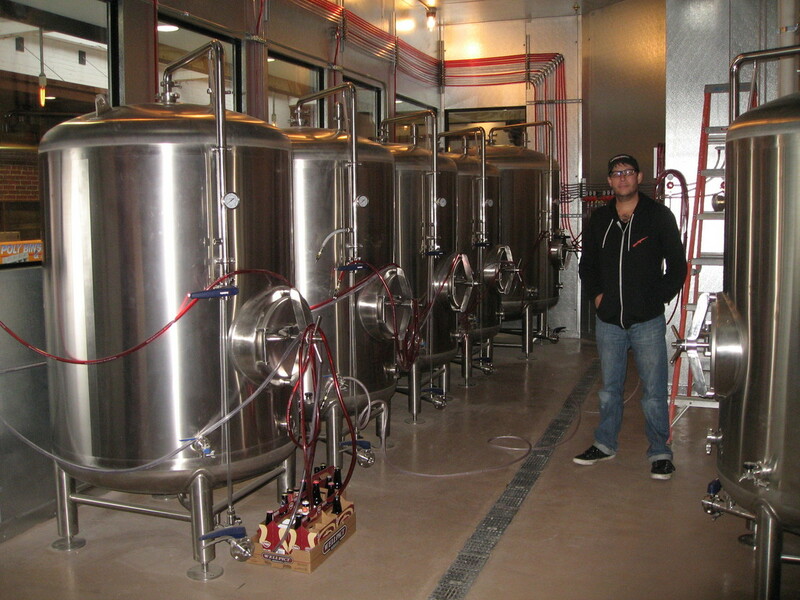 For fermentation they have three 10 bbl plus two 20 bbl unitanks. That translates into some very long brewing days to complete two full batches for the 20 bbl cylindrical conical fermenters. That also means they'll need a lot of thirst customers to keep up with the supply. They have the capability to produce 18,000 barrels (half million gallons) per year. My prediction is that the supply and demand will work out fine. In their malt storage and milling room I noticed stacks of German Weyermann and British Fawcett malt bags. It is nice to see a brewery using the finest grains to pair with that premium Yellowstone River water. I was not allowed to sample any of their beers, but I was told for the opening they would be serving an Imperial Hefeweizen, an American Hefeweizen, an Amber, an IPA, as well as an English Summer Ale. Behind the long bar they have two separate banks of twelve taps - one for serving pints and another for growlers to go. So expect a wide selection of beers on tap as Überbrew ramps up production. They are currently providing their spent grains to a local goat farmer. The plan is to trade feed for artisan goat cheese to serve and pair with Überbrew's beers. Sounds like a good plan to me! I sat down with owner and brewer Mark Hastings to discuss their name and philosophy. Über means "above" in German and has superlative connotations in the English language. A perfect fit for some German-inspired American brewers. "Überbrew... superlative beer is what it means to me," Mark stated. "Our philosophy is to provide the best of everything we do. Excellent and knowledgeable service, great food, the best beer, etc. We also are excited about promoting beer-food pairings and educating our customers about how fine beer and different dishes go together. Much like wine." And this doctrine of quality spills over to every aspect of the facility. From the beautiful modern/rustic tasting room to the meticulously laid out brewing facility. Montana is already in the top tier of states when it comes to breweries per capita. Überbrew will be Billing's fifth brewery, and there are rumors that two more are planned - these would be located in the West end of the town. Billings barely has 100,000 inhabitants, but they have proven to be quite thirsty. If you live in the area, head on down and try out Montana's newest brewery. It is also a short walk to the other breweries downtown, and the Railyard is just down the street. If you don't live in the area, next time you plan a trip think of Montana. For a beer lover it will not disappoint.